Colorful and festive, our Cinco de Mayo / Fiesta Decorating Kit is a must-have for any "South-of-the-Border" Celebration. Each kit includes a Fiesta Banner, Cut-Outs, Tissue Balls, and more! 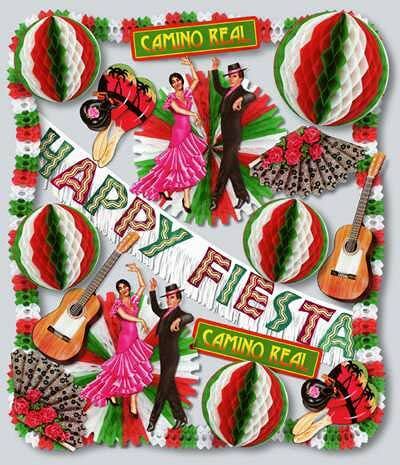 Fiesta Theme Decorating Kit - 4 14" Art-Tissue Balls, 1 19" Art-Tissue Ball, 2 25" Art-Tissue Fans, 12 20" Latinain Cutouts, 1 8' HAPPY FIESTA Banner, 4 12' Arcade Garlands. On Sale - Save 25%! We also offer a wide selection of Holiday Decorations, Including Mardi Gras Decorations, Oktoberfest Decorations, New Year's Decorations, and More! For more information or a FREE 104 Page Catalog featuring all our Bar & Nightclub Supplies, please contact us at 1-800-233-0828.